Are you a salesperson who's been considering a move into sales management? Many salespeople view the change to sales management as a logical next step in a sales career. However, you may not have considered the difficulties that will arise from this change. Going from a salesperson to a sales management role is tricky under any circumstances. The behaviors and attitudes that great salespeople share are completely different from the ones that make a great manager, and that can be difficult to accept. Everyone is naturally resistant to change (as every experienced salesperson knows) and if you've always had highly successful results from certain behaviors, you'll have an even harder time changing them to new and untested approaches. When a salesperson is promoted up to manage her old sales team, the transition is even more complicated. The salesperson in question has probably been a member of that team for at least a couple of years. She's been working as an equal with people who now report to her. 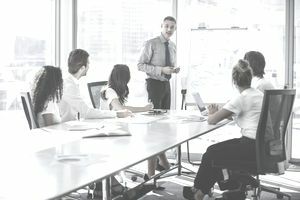 Many sales teams become quite close and socialize after business hours, getting together to brag about big sales and gripe about clueless bosses. On the other end of the spectrum, sales teams can be highly competitive, and the individual salespeople might not trust each other — in a worst-case scenario, they may even do their best to sabotage each other. If you have a close relationship with the other members of your sales team, then becoming their manager will force you to change that relationship in a major way. As their new boss, it will be inappropriate for you to join the team in mocking the company or swapping office gossip. You should meet with each member of the team one-on-one and quietly explain the situation so that they're not confused by your shift in attitude. But unless you are very lucky, your friendships with your former teammates will change into a simple professional relationship. If this bothers you, you should not accept a management position over them. Perhaps your company would be willing to give you a different team to manage instead. If your former teammates are super competitive with each other, your challenge will be different but no less daunting. Your new reports will be used to thinking of you as a competitor or even an enemy. But to be a good manager, you've got to get them to accept you as an ally. It will take time to build trust between each of your salespeople and yourself, so be patient. The best way to prove yourself to the team is to act like the ally you want to be. Ask for ideas and suggestions and then implement them (assuming they're not entirely wacky). Publicly give credit to the salesperson who gave the idea if it goes well, and take the blame yourself if things fall through. That may sound unfair to you, but it's an integral part of your new job as sales manager. The most important part of a sales manager's job is giving her salespeople what they need to succeed. It can include anything from setting up a sales training program to firing a salesperson who just doesn't cut it (because in that case, what he needs to succeed is a different job). But the most crucial task to help your salespeople succeed is coaching them. When something goes wrong, it's often easier for someone outside the problem to figure out what caused it. A salesperson who is suddenly not making enough appointments might not realize that his script has gone stale and he sounds like a robot during cold calls. In these kinds of situations, the sales manager is ideally placed to both identify the problem and help to fix it. Not all sales managers are good at coaching. Some prefer the administrative side of management, while others like to spend as much time as possible on the front lines selling. Fortunately, coaching is a skill anyone can learn on the job. It might not come as naturally to you, but you can still become a competent coach with practice. In many ways, coaching is like selling. You'll need to figure out what is holding a salesperson back and then nudge him into realizing it for himself. As with sales, this is often best accomplished by asking questions rather than coming out and telling the salesperson what he must do. In the above example of the salesperson who is struggling to make appointments, the sales manager might ask questions like, “What is your cold calling process?” and “What exactly do prospects say when you call them, and they turn you down?” These questions help your salespeople to identify the problem and the solution, which is a lot less confrontational than if you simply told them what to do. It also gives them a feeling of ownership of the solution, since they feel like they came up with it themselves. Good coaches take time with every salesperson, not just the top and bottom performers. Every salesperson has both strengths and weaknesses; sales coaches should applaud the former and help with the latter. Often the best way to evaluate a salesperson's best and worst qualities is to go into the field and see how he operates with his prospects. Ideally, you'll want to shadow each salesperson on your team at least once or twice a year. While it's important to spend time with each member of the sales team, realistically most of your time will be spent with the salespeople who are having the most trouble meeting their goals. A salesperson who is trying hard but just isn't able to succeed may need an intensive coaching program involving several weeks of observation and assistance. It will be time-consuming, but if the result is a salesperson who exceeds his quota every month instead of struggling to meet it, it's time well spent. Coaching won't do much good with a salesperson who doesn't realize that he has a problem. Any salesperson who blames his poor performance on outside factors simply won't take a coaching program seriously. In this situation, it may be necessary to let the salesperson fail or even get rid of him before his attitude contaminates the rest of the team. Another important part of sales management is making sure your salespeople are equipped with the right tools. These tools can make all the difference between success and failure — at the very least, they'll make selling a lot easier and your salespeople much more efficient. First and most basic, your team should have an ideal customer profile. Every company and every product has an ideal customer. The ideal customer profile is simply a list of the characteristics that your best customers and prospective customers share. This profile is incredibly useful in qualifying prospects early on and can help separate the very best potential customers out of the pack, allowing your salespeople to focus their time and energy on the most potentially rewarding sales. Second, you should set up a sales metrics tracking plan. Tracking your sales team's metrics helps both you and them. It helps you because you can see exactly where they're strongest and weakest in their sales abilities. If a salesperson hits a slump, you can use metrics to see where in the sales process they're losing those sales. And it helps your salespeople because they can identify potential problems before they start to cut into sales. If a salesperson knows that he's booked half as many appointments this week, as usual, he knows he needs to hit the phones big-time — before his pipeline empties out. Third, take a look at your new hire training program. Even the most experienced salespeople will need training when they join your company. At a minimum, they'll need product training and training in your company's basic systems, like phones, CRM programs, and other tools your sales team uses. It's a good idea also to assess the new salesperson's basic sales skills and decide how you'll help with any weak areas. The faster you get your new hire up to speed, the faster she'll be earning revenue for your company (and you). You should also evaluate your continuing training program. If a sports team doesn't train regularly, you wouldn't expect them to win. The same applies to your sales team. Like most professionals, salespeople need to stretch their skill sets and pick up new strategies on a regular basis. But just signing your team up for random training sessions won't help. You need a plan based on what skills they need to develop so that you can look for the best training options to fit your team's specific needs. Next, consider your product differentiators (the factors that make your product different from the competition). It may require a sales meeting to find out which differentiators your salespeople use and confirm that they're fairly consistent across the team. If your marketing department hasn't come up with some “official” differentiators, work with your sales team to brainstorm at least one for each product. Every time your company develops a new product or changes an old one, you'll need to come up with new differentiators. Finally, you'll need to make sure that your sales team is aware of and in line with the company goals. Your company probably has certain products that you want to push, other products that are less important, and a few that are loss leaders (meaning they exist to attract new customers but don't make the company any money). Does your sales team have this information? If not, how can you expect them to hit those goals? Keep your sales team in the know and work with your CSO or CEO to build a compensation plan that will reward the behavior that your company wants most. For example, if Product X has huge profit potential for your company, put in a bonus for salespeople who sell a lot of Product X. If another product is less lucrative, don't offer an extra reward for selling it.